Educational Visits at North Norfolk Railway01263 710483work Educational VisitsSteam heritage railway chosen by The Sunday Times in 2009 as Britain's best full size steam railway trip. We offer a range of out-of-school education events and field trips structured to support National Curriculum key stages. All are cross-curricular. We hold the Government's Learning outside the Classroom quality badge. ""World War II - The Evacuees"" is a particularly popular workshop. OPENING TIMES: 1 April to 31 October. SUGGESTED LENGTH OF VISIT: 2 hours. 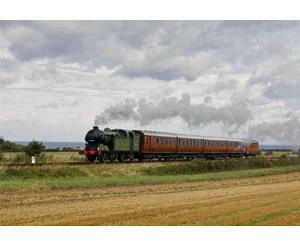 Steam heritage railway chosen by The Sunday Times in 2009 as Britain's best full size steam railway trip. We offer a range of out-of-school education events and field trips structured to support National Curriculum key stages. All are cross-curricular. We hold the Government's Learning outside the Classroom quality badge. ""World War II - The Evacuees"" is a particularly popular workshop. Free preliminary visit for teacher, teacher and pupil resource packs, qualified schools guide/specialised education officer on hand, classroom/study area, indoor eating area available, outdoor eating area available. Winner of the Independent Railway of the Year 2006. Winner Community Award, Norfolk Tourism Awards 2005. Sheringham Station is just off the A149. Holt Station is just off the A148 at High Kelling. Timetables and information can be accessed via the public transport information partnership Traveline. Traveline allows you to plan journeys from and to a postcode, postal address, town or village, named station or stop, or point of interest. choose your location then simply type in where you are travelling from and to for a detailed trip summary.